On October 15th, we celebrate the International Day of Rural Women. The role of women as key players in the achievement of Sustainable Development Goals (SDGs) is with time becoming more evident. So much so that World Food Day is also celebrated on 16th October followed closely by International Day for Eradication of Poverty on 17th October showing just how these three issues are interconnected. To put this into perspective, globally rural women make up approximately 43% of the agricultural labour force whereas, in Africa and Asia, rural women make up almost 50% of the labour force. 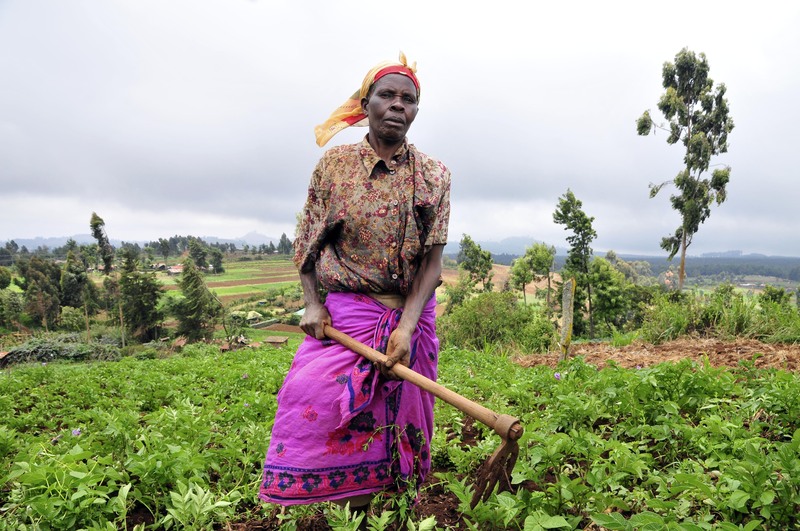 With this in mind, if we are to attain the goal of food security in Africa by 2030 as stated in the SGDs, then the issues facing African rural women need to be studied and analysed contextually for proper and workable solutions. Additionally, with 76% of the world’s extreme poor living in these rural areas, the importance of women as key players in the eradication of poverty cannot be understated. The LDRI, together with our partner Results for Development Institute (R4D) and with support from GPSDD, is currently carrying out a pilot project on “Catalysing Data-Driven Market-Based Solutions for Small Holder Farmer Fertilizer Uptake” in Muranga county with a special focus on Maragua, Gatanga and Kangema sub-counties. From the information found so far after talking to both male and female heads of household, the majority of the women in the county practice subsistence farming with crops such as maize, beans, potatoes and some vegetables. On the other hand, most of the men focus on cash crop farming mainly tea and coffee. These gender roles in agriculture more often than not hold women back. For example in our work at LDRI, we have observed that what determines the fertilizers used by farmers is the availability of funds from the previous planting season and their accessibility to credit. Credit is usually made available by institutions such as Kenya Tea Development Authority (KTDA) and coffee cooperative societies. The farmers then settle their debts later using their produce. However, because these lines of credit are limited to cash crops, many women who lack funds to buy fertilizer simply use manure and small quantities of Calcium Ammonium Nitrate (C.A.N 26% N)- a top dressing fertilizer. This negatively affects the yields of subsistence farmers putting them at a disadvantage. In addition, education of farmers is very important. Cash crop farmers get more education and resources at their disposal due to the government’s interest in them. In Muranga both subsistence and cash crop farmers have self-help groups where, with the help of an Agricultural Officer, they learn the most suitable type of fertilizers to use depending on the crop planted. On top of this, cash crop farmers are also advised by coffee factories and work together with coffee societies and KTDA making them more versed and prepared compared to subsistence farmers. For impactful changes to be seen in agriculture, policy-makers need to analyse how their set policies are contextualized by its recipients. Due to issues like traditional customs, laws may not always have the same effect on women and men. For example, despite the goal by SDGs that, “All men and women have equal rights to ownership of land by 2030” and the moves by governments to set up fair land tenures, customary laws still prevent women from owning land. Currently, women own less than 20% of the world’s land yet land not only brings economic but also social empowerment. Still, amongst this 20%, studies show that women tend to have small land holdings compared to male headed households and their lands may be less fertile and distant from the homestead (Doss, 2001). For us to meet our goals there needs to be equality in resources in both female and male-headed households. However, this is not the case and this inequality in resources has long-term effects on women farmers. Land is a primary factor of production and acts as collateral. With collateral one can get credit which enables them to access input markets for fertilizers and certified seeds. This then determines their yields and market access creating a continuous cycle into the next planting season. When a woman is empowered she is able to involve herself in the controlling of household income. Studies show that women who control their household income spend more money on nutrition, health and clothing compared to men. Policies need to be analysed in a gender-sensitive manner. How do they affect each gender’s ability to access land, credit and other related services? How does it affect their ability to invest and benefit from new opportunities in the market? For change to be seen, the perception of rural women farmers needs to be changed. Women should be seen as more than just family providers and caretakers as this singular narrative can expose them instrumentalisation and exploitation in labour. We are long overdue in giving rural women the credit they deserve: equal shareholders and critical players in the push for development- no strings attached. Next:Data Interoperability. The Next Frontier in the Data Revolution.